ELVERTA STUDIO - MINIATURE GIFT PAINTING WORKSHOP & WEEKLY CLASSES - WED. OR THURS. 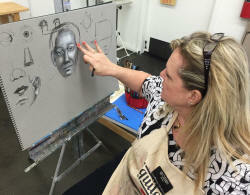 SACRAMENTO FINE ARTS CENTER (SFAC) - WEEKLY ONGOING CLASSES - TUESDAYS- ONGOING CLASSES! As an art educator in her 30th year of teaching, this artist has taught artists from all over the world. Bobbi started out as a portrait artist in 1982 and still enjoys painting portraits for her many clients. As a founding member of the Portrait Society of America, her education is strong through learning from the greatest living painters. The Portrait Painter’s Way, a book written by Bobbi Baldwin, is now a must have for anyone who wants to understand how to paint people (available on Amazon). Her knowledge of people led way to the ability to capture even more muscular beings. As you know, horses and people are the most difficult of all subjects for any artist. But, she has proven to excel at both. Because knowledge is passion for this artist, she seeks to paint all subjects and share that understanding with her students. She is a passionate teacher with a great ability to share her depth of knowledge. As a teacher, I must first see my students as individuals and second as a budding artist. Each person I encounter comes to the easel with a different set of learning skills and life lessons. It is my intent to give wings to my students feather by feather. The passionate muse of art is in my work and sharing that with others is life fulfilling. What I know and do is expressed in only a moment in time, but we all hope that it lasts through eternity, either through knowledge passed down or our work itself. I once heard that the measure of a good teacher is only through the students who surpass them. I look forward to seeing my students inspire the world with their own work.